Back when I didn’t know who Gabriel García Márquez was, I met Richard M. Morse, who channeled one of his characters. Like the Buendía family patriarch in “One Hundred Years of Solitude”, he did not care much for childhood or children, thinking it to be a less interesting phase in one’s lifespan. Despite his dislike for infants, Morse had even babysat my sister and me a few times, and countless hours of our first year in Washington DC were spent in his home: four levels of a lonely house, filled with books and dust, shelving the stairs up to the attic and down to the basement. Rarely did we go outside and play in the yard. It was cold and weedy. Out of entertaining options, I thus took pleasure in cleaning and reorganizing his messy office. He would come in every once in a while and make sure I wasn’t trashing his library skills and establishing some color pattern based on book covers. I wasn’t. I would also run down to the basement and discover new-ancient junk, which I still love doing. I found pots, garden tools, books, chessboards, and canned food. There was very little for a little girl to do at Morse’s place. When our uneasiness became unbearable to everyone, we’d drive down in his small baby-blue Honda to the deli and get some sandwiches. I didn’t really like them, they were full of celery and mayonnaise, both of which I dislike until this day, but they helped time go by. When I had finally fully explored the familiar four levels of his Foxhall home, I’d sit at the table where he and my mother discussed books and ideas for what felt like unending hours. And, hopeless, turned to writing. Morse was a very tall man. Tall and somewhat lanky. He was already an old guy by the time our paths crossed, and yet he gracefully moved about the four levels, going up and down stairs, just to find that one quote or book or chapter he wanted to share with friends, and he knew exactly where to find it. He wore prescription glasses, fake teeth that he could pull out, had very large hands and feet and also this long string of hair coming down by his right ear, which he’d fashionably throw over his forehead and rest behind his left ear. It camouflaged his baldhead, and would fall down every so often. My favorite Morse task was, certainly, replacing that bit of hair back where it belonged, restoring his dignity. I then stroked his baldhead, gave it a kiss and thus had some intimacy with this man who was such an unequivocal presence in my childhood and whom I didn’t know, then, thought very little of the infant class I represented. “It’s for the girls”, he’d say while I adjusted his hair, “I let it grow for the girls. They love it!” I giggled, every time, charmed. Eight years later, Morse died abroad. I hadn’t seen him in years when it happened, and I wasn’t much up-to-date with his health. It was difficult for my mother. A mentor he was to her. I remember the tip of her nose, red from tears and loss. We flew out to DC, my sister and I, to join my mother for memorial services held some 5 months after his passing. Lots of suited men were speaking at the ceremony that took place at a local university, shaking hands, making compliments and congratulating the family for his work. Shortly thereafter, a reception was held at the old place, home to my first cleaning adventures and writing attempts. In truth, it was only when all other options had been explored that I turned to writing, sitting by the two of them, Morse and my mother. There are no copies of what was produced back then. I remember, however, showing it to Morse, not realizing it was when I was most bored that he’d find me the most interesting. I was quieter and, well, I was doing something intellectual, both of which pleased him. Morse’s place was the same yet different to me. The smell was different. The staircase was book-free, the pile in the bathroom was gone, the boxes in the basement were closed and shelved, the windows were open, the couch linen had been removed, chandeliers and crystals had been made visible, there was a TV set – which, to my surprise, had always been there, and gone by unnoticed -, a tended garden welcomed guests, the fridge was loaded. Something about his four-story home now made it seem so out of place, like ancient architecture turned modern, like a library turned into a franchise restaurant. The sacred element of his intellectual intimacy; his lack of care for how things actually looked like to possible visitors, a certain drive that demanded, in return, that he overlook the pantry, fashion and even his children; it wasn’t there. His smell was gone. His charisma. His drink and cigarette. His sense of humor. His wit. Morse wasn’t there. His home was taken by guests, yet stripped of what gave it life. So strange. How he had managed to populate all of these rooms on his own. The party was a lively gathering, which would’ve pleased him. There were drinks and Caribbean food. His family was present and loving. We didn’t stay long, but it meant something to us. Four days later, we went silent in front of our also dusty TV set while September 11th 2001 took place. That year was one of closure and beginnings. I was then a freshman journalism major in college, the seeds of the woman I was becoming flourishing not only in my body, but also in my personality – both of which would have appealed to Morse’s aesthetic, or so I like to think. I was in love, truly in love, for the first time. I had forgiven my dad. I read extensively, discovered new authors, new sounds in music, film directors, changes in myself and in the world around me. I had read “One Hundred Years of Solitude” and I knew the Buendía family tree by heart. “This”, I thought to myself with satisfaction, “would’ve been a great time to talk to Morse.” I would appreciate his running up stairs to find that one quote. There’s no sadness or nostalgia in the statement, but rather a sense of accomplishment. I finally dug Morse, and I suspected he would dig me too. He was the first person I saw when I arrived in the States for the very first time. He picked me, my sister and my mother up at Washington National Airport in his Honda, a messy little corner of the earth, literally no more than means to end, something he couldn’t go around, and that he would, so, accept and practice in his own terms. In it, he drove us back to Foxhall where we were housed for a few days on the top floor of his home at Volta Place. I remember it being very cold up there, it was January and on our first morning, there was snow covering the front lawn. Magical it was, to my sister and me. Morse came slowly up the stairs to wake us up. This happened just a few days before Clinton took office as US president and I was sent to John Eaton Elementary School, in DC, and taught to pledge allegiance to the flag of the United States of America. A couple of months later, I was scribbling my first English poems at Morse’s dining table-turned-into-desk. English was becoming natural faster than I could take it in. It was only recently, ten years after Morse’s passing, that I was given the delightful task of translating his correspondence with British scholar Leslie Bethell into Portuguese for a book chapter in a compilation my mother and a friend put together to honor his work through the work of other authors. And boy, did I laugh. I had the feeling that I was at last able to understand his word choice and grasp his intelligence, his playful use of words, his graceful and refreshing lack of morals, his self-irony. It was most gratifying. And I am now working on a full compilation of all of his articles not yet translated into Portuguese, a language he rejoiced in and that he so dearly embraced in his many trips and his stay in Brazil. Morse gave me a book as a child that has been sitting in my old bedroom, at my mother’s place. When I first showed it to her, she admitted to never knowing Morse had given me that present, and that it meant a lot to have been given a book from his private collection. Not only that, but the first book ever given to him by his father, in the 1920s, who, alongside his mother, a strict woman, pushed little Dickie Morse to skip grades at age 7 so no time was wasted with lower minds. “A Children’s History of the World”, by V. M. Hiller (headmaster of Calvert School, 1924) still sits in my old bedroom’s bookshelf, close to Gabriel García Márquez and “Morse Code”, with my translation of his correspondence in it. Almost twenty-years earlier, he had been the first to tell me about Morse code, bragging about his name, and leading me to believe his games. I have a picture of that day, at our place, where Morse seldom came. 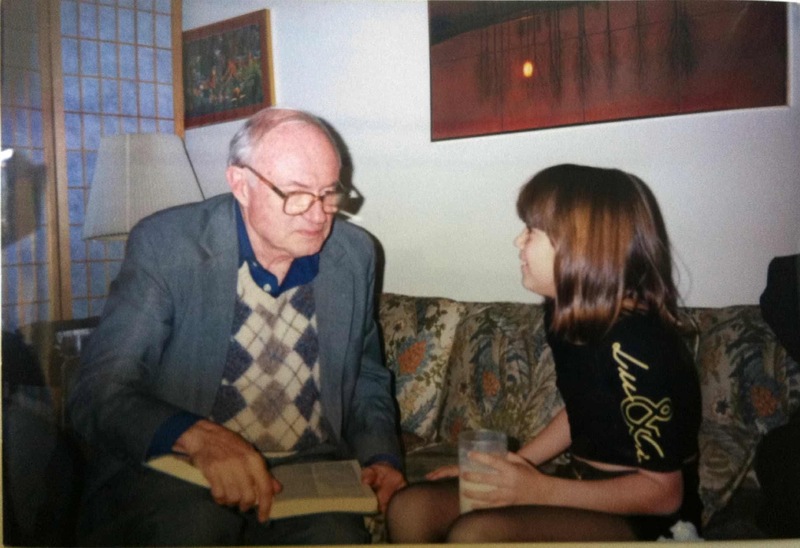 Between fixing his hair, sharing my scraps of childish poems, buying celery sandwiches, organizing his books and, above all, having been given that book as a present, Morse and I overcame a large age and cultural gap and, in our own respectful manner, became friends. Almost two decades later, I still discover fragments of memories I have from those early years, and new ways through which Morse has influenced, inspired and affected my family and me. In my dreams, I like to think his perspective on children came out transformed by this encounter. In my fantasies, I was the child that made him tick.